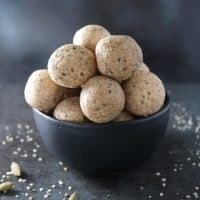 These healthyISH, 6-ingredient, indulgent No Bake White Chocolate Almond Bites are tenderly spiced with cardamom, are gluten free and dairy free and packed with gobs of white chocolate. Before I started this blog, weekends were for grocery shopping. Back then, my daughter and I would pile everything we needed for a week into one grocery cart at one location (which would change from weekend to weekend) and be done for the rest of the week. But, things have changed a lot since then. Somedays, I’ve even hit up 3 different stores in one day! Even when my daughter and I spent a few days in Seattle, we’d hit up Amazon Go for cupcakes, Pike Place Market for mooncakes, and Trader Joe’s for salads! BTW, have y’all been to Amazon GO? This place is so awesome – just download the Amazon Go App, scan it at the entry, grab your stuff and GO! 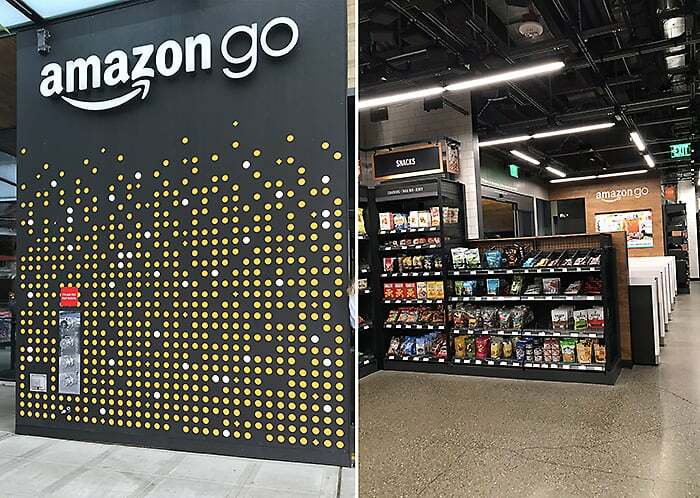 I cannot wait for an Amazon Go to open up in Atlanta! All that store-hopping can be a tad bit tiring… that’s why I make a batch of these Almond Pecan Bites or these Chocolate Pistachio Bites or these No Bake White Chocolate Almond Bites to indulge in when I need a break! I came across this article that talked about what the best days for grocery shopping were… and Saturdays and Sundays weren’t anywhere on that list. According to this article, the best day to stock up on wine is Tuesdays, bread and beer are cheapest on Wednesdays, sweet and savory snacks seem to go on sale on Thursdays, and ice cream and produce get more budget friendly on Fridays! I guess I will stick to my store-hopping ways and make sure I have a stash of these No Bake White Chocolate Almond Bites hanging out in my fridge! • Make sure the white chocolate is melted but not overly hot. I melted my white chocolate in my microwave. Set broken up pieces of it in a microwave safe dish, microwaved it on high for 30 seconds, took it out and stirred it vigorously, then placed it back in the microwave and set it for another 30 seconds, and stirred it till all little lumps were dissolved. • Melt the coconut oil, but again, don’t let it get too hot. 20 second should do it – if microwaved. • Roll the mixed ingredients up tightly. Even though the ingredients might be a bit crumbly when mixed together, they will form well when rolled up. While these 6-ingredient bars are gluten-free, dairy-free, and carry a hefty dose of healthy hemp hearts, they are a tad bit on the indulgent side with the amount of white chocolate I used in them. But, the way I see it is, I desperately need balance in ma belly! These little healthyish indulgent bites make for a perfect little afternoon pick-me-up after store-hopping as well as a delightful dessert when that sweet tooth comes calling! 2 tbsp coconut oil, melted for 10 to 20 seconds in the microwave. 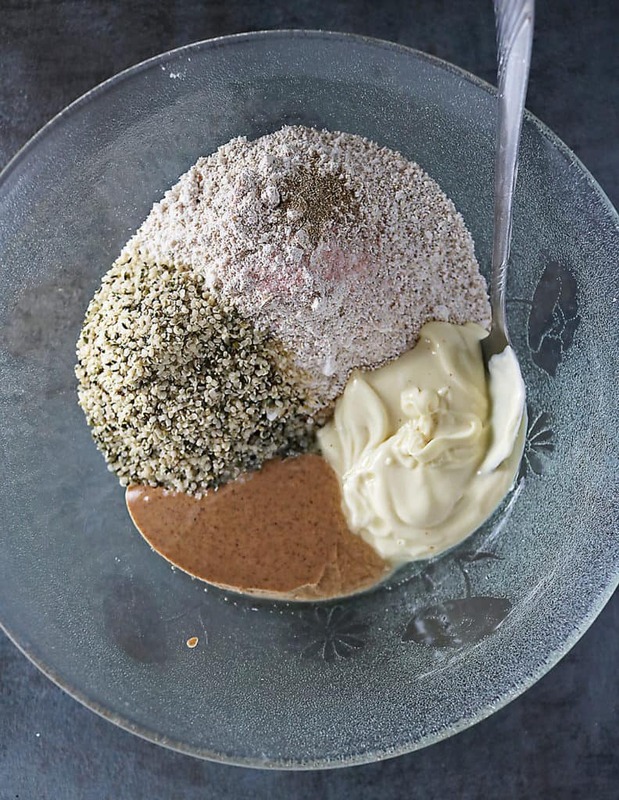 Add the oats, hemp hearts, almond meal, cardamom, and salt to a bowl and set is aside. Now melt the white chocolate. Set broken up pieces of white chocolate in a microwave safe dish, microwave it on high for 30 seconds, take it out and stir it vigorously, then place it back in the microwave and set it for another 30 seconds, and stir it till all little lumps are dissolved. Pour the melted (but not hot) white chocolate into the bowl with the dry ingredients. Add the melted coconut oil into the bowl with dry ingredients and white chocolate and, using a spoon, combine them well. 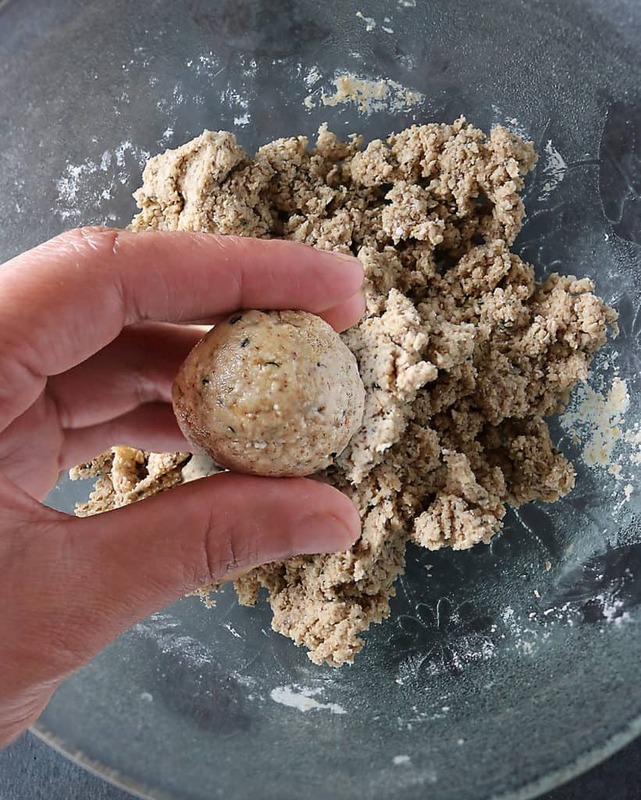 Using your fingers, gather up a bit of the mixture, form it into a rough ball and then roll it to smooth it out. Then, place on a tray. When all the bites have been rolled, place tray in refrigerator for 30 to 60 minutes for bites to firm up. Bites can be stored for upto 7 days in an airtight container in your refrigerator. I like that these are “healthy-ish”. I’m a fan of healthy with a little tiny bit of naughty lol. Perfect for on the go! I love making energy bites likes this and these white chocolate and almond versions sound amazing. Yummy! These white chocolate almond bites look excellent! 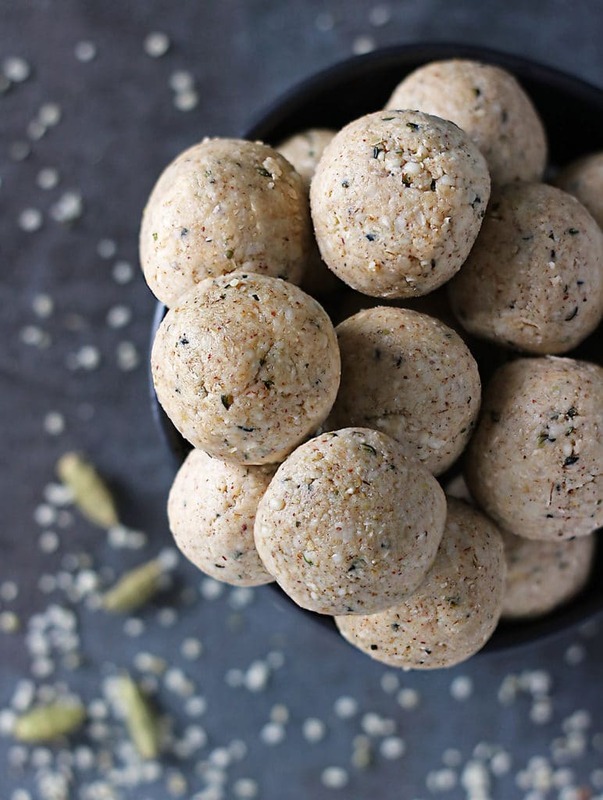 I haven’t used hemp hearts in a while but now I have to get some just so I can make your delicious bites!! 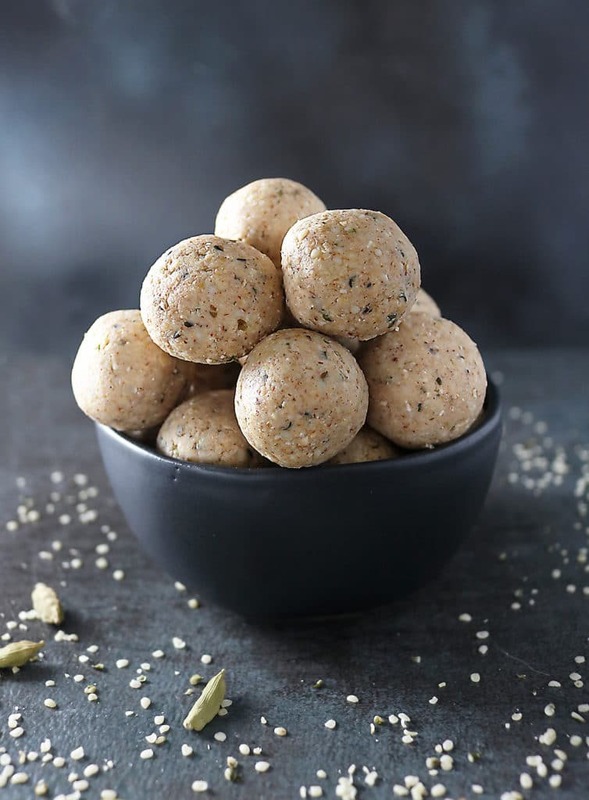 Love that you added hemp hearts to these delicious balls. I’m really looking forward to them. I used to do that too — a few things here and a few things there! Now I’m back to one big trip and maybe 1-2 small trips for more produce. I was spending way to much going to the store every day! lol It’s so interesting that certain days are better for certain products! These bites wouldn’t last long in my house at all either. The white chocolate and almond combo sounds amazing, especially with the hint of cardamom! I totally hear your shopping issues! Some weeks I feel like I spend more time grocery shopping than I do actually baking or eating :). I could totally use a batch of these bites–they’re basically my dream snack. Cardamom is my favorite flavor EVER! Add white chocolate and I’m all over it! Interesting article! Like you, we used to do a weekend grocery store run to get everything we needed for the week. That slowly turned into a grocery store run with Daddy and Robbie, but we still do weekends…albeit very early in the morning! Robbie always takes a snack with him to the store…I mean grocery shopping can make you hungry! I’m thinking I should pack some of these bites for me next time I go. I love the flavors you’ve got going on in these bites!